The first purported leak of the case design for the iPhone 7 appeared yesterday on French blog Nowhereelse.fr. 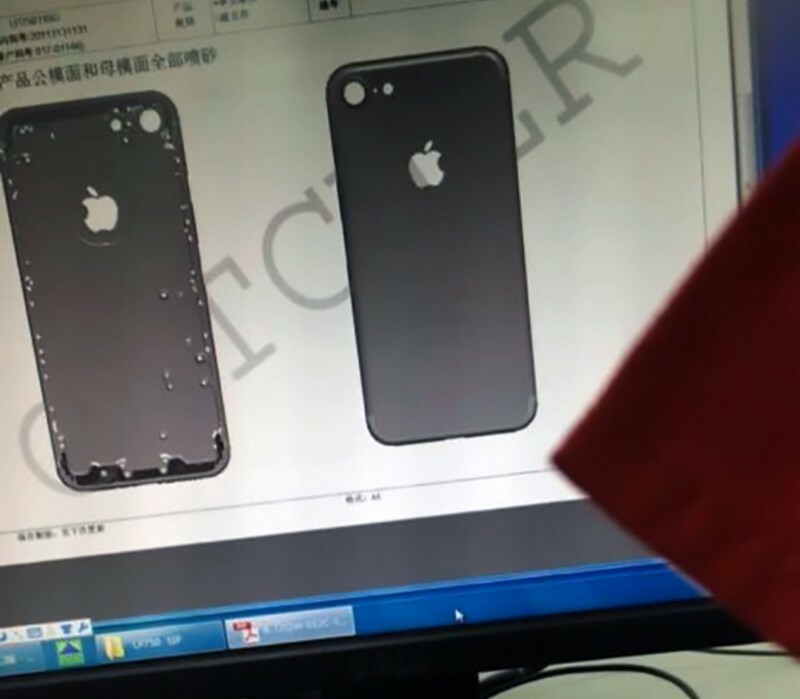 The alleged images from Taiwanese phone case manufacturer Catcher Technology depict a subtle chassis redesign for the iPhone 7, which is expected to be released by Apple this coming September. The renders are consistent with information obtained by MacRumors last month from a previously reliable source claiming that the handset will lack antenna bands across the rear. As expected, the images show antenna bands are limited to the sides and around the top and bottom edges of the chassis. In addition to the cleaner all-metal look, the images of the rear of the case depict a larger hole for the camera. The orifice is described as closer to the edges of the chassis and forming a "slight bulging outgrowth", a phrasing which doesn't appear entirely consistent with our earlier source's claim that the camera sits flush with the rear casing. The chassis leaker adds that the design "seems slightly thinner than the iPhone 6s, confirming in passing the lack of a headphone jack port". That would appear to support last week's leak of the first protective case prepared for the iPhone 7 showing two openings for stereo speakers in lieu of the 3.5mm headphone jack on current iPhones. However, the purported change is difficult to confirm one way or the other based on these latest renders. Earlier yesterday, Nowhereelse.fr also posted images allegedly showing dual-lens camera component parts for the iPhone 7 Plus, however these were later revealed to be identical to images that surfaced in early January. Some rumors claim the dual-camera setup may be exclusive to the iPhone 7 Plus, which reportedly may be called the iPhone Pro. blurry and slightly out of shot, seems legit. Took you long enough to report on this MacRumors... probably the last rumor site to cover this by over a day. I'm sorry, but who needs their phone to be so thin that it doesn't have room for a freakin' headphone jack? The first purported leak of the case design for the iPhone 7 appeared yesterday on French blog Nowhereelse.fr ('http://www.nowhereelse.fr/iphone-7-photos-catcher-112935/'). [doublepost=1457943715][/doublepost]Come on Apple, bring back the classic iPhone 4 design! I am stunned at how iPhone-like the shape appears to be. I was expecting a pyramid-shaped phone, or perhaps dodecahedron-shaped, if they wanted to go in the other direction. People wanted revolution, not another slippery evolution. This is what the 6s should have looked like. Not saying we want a pyramid shaped iPhone, I'm just saying we expect a new and fresh design. We all know the "S" models look the same as the non "S" models; the "S" basically getting under the hood changes and improvements, with the same design. But when you go from an iPhone 4 to a 5 to a 6 to a 7, there should be some new design ideas introduced. Otherwise it would appear that Apple's management and/or designers are simply bored, uninspired or complacent.